Texas Wing is sadden by the news that two of our members passed away this morning. 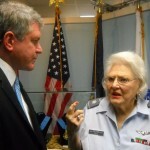 Lt. Col. Jayne Pace, a Congressional Gold Medal recipient and histororian for the Thunderbird Squadron in Group IV. Capt. Bob Bruton, Group III public affairs officer and a member of CAP since 2010. Funeral arrangements are pending for both members.